Although the Dutch did have trade links with India, the historic connection is not as strong as, say, with Great Britain, and therefore Indian restaurants are not so well established in The Netherlands. Several of my Dutch colleagues seem nervous at the idea of Indian meals – concerned that they will suffer the consequences the following day, and unlikely to cook Indian food at home. 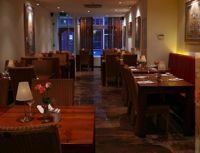 There are however several Indian restaurants, take-aways and delivery shops in Amsterdam, including Shiva, open since 1992 and located on the section of Reguliersdwarsstraat that runs between Rembrandtplein and Vijzelstraat. We visited on a rainy Saturday around 8pm and were lucky that one table for three was immediately available, although later in the evening when potential diners arrived the restaurant was full and they were advised to come back later. The theme of the restaurant is based around the god Shiva, and decorated with old-fashioned paintings of Shiva throughout. The restaurant also however has a modern feel, with natural materials and traditional Indian cooking. Shiva caters for both meat eaters and vegetarians. Starters include dal Soup for €4 to king prawn pakora (deep fried prawns served with chutney) for €8. Main courses are divided between tandoori dishes, chicken or lamb, and vegetarian sides which are also available as a main. The tandoori options ranged from tandoori chicken for €12.50 to tandoori salmon at €20.50. Meat main courses included chicken and spinach curry or lamb indaloo at €12.50, with vegetarian options such as pumpkin and potato curry slightly cheaper at €8. There was also a range of thali or biryani selections. Papadoms are an extra at Indian restaurants in The Netherlands, but were available along with various dips, rices or naan breads. We picked the vegetarian thali (€14), plus chicken korma (chicken in a creamy coconut and cashew sauce) and rogan josh (lamb in spiced tomato sauce) (both €13.50). The thali with its multiple dishes provided best value for money, starting off with a medium spiced pumpkin soup. The main course contained small portions of steamed rice plus a vegetable curry, half a naan bread, a lentil-based dal dish, spinach and paneer curry, vegetable korma and a sweet kulfi, a milk-based dessert flavoured with almonds and herbs. All the dishes were tasty, with the rogan josh having the spiciest flavours. Unlike korma dishes in the UK which often emphasise the coconut, both the chicken and vegetarian korma at Shiva were strongly flavoured with cashew nuts. Delicious but maybe not matching the expectations of British diners. Shiva is fully licenced and serves both wine and either Indian or international beers. The bill came to €53 for the thali selection, two main courses, two naan breads, mineral water and a Dutch draft beer. Shiva does accept various cards, although unlike many Amsterdam restaurants they did deter us from splitting the bill and accepting three payments by card mainly because we would have all had to go up to the bar to enter pin-codes separately. This is quite a normal way to pay in The Netherlands however, and if we had insisted then it would not have been a problem. Shiva provides good value for money in a nice atmosphere with friendly and fast service. This is definitely somewhere worth a visit, so long as you don’t expect the dishes to exactly replicate the same item either in India or elsewhere in the world such as the UK.